A hike is just not the same without your four-legged best friend. Grab your Mountainsmith K-9 Dog Pack, and hit the trail with this dogonomically correct gear hauler. Mountainsmith consulted a local Golden, CO sled dog veterinarian to assist with the designs to ensure a proper fit that will maintain comfort all day long. A hike is just not the same without your four-legged best friend. Grab your Mountainsmith K-9 Dog Pack, and hit the trail with this dogonomically correct gear hauler. Mountainsmith consulted a local Golden, CO sled dog veterinarian to assist with the designs to ensure a proper fit that will maintain comfort all day long. 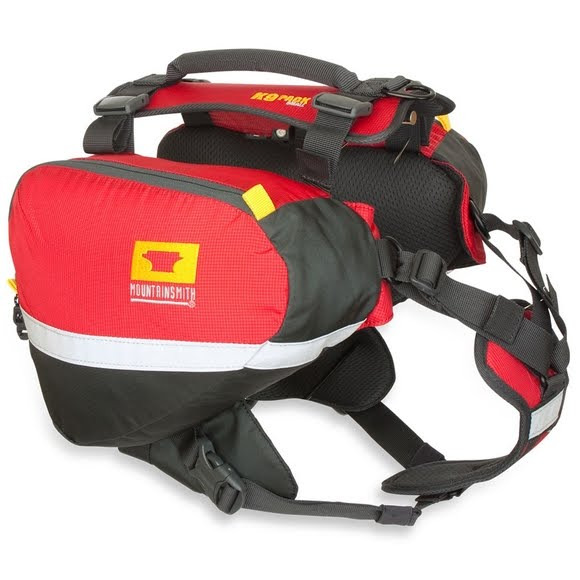 Combining that insight with 30 years of dog pack building experience brings us to the most efficient dog backpack in the industry. Often times, dogs proudly take on the responsibility of carrying their share of the load and can make a significant difference in the weight of their pack. Be sure to use this fit guide to find the proper size and fit of your pack. They always recommend airing on the smaller side. Measurements Small: 10" x 7.75" x 8.25" / Medium: 13" x 11" x 9" / Large: 15.5" x 11" x 11"